Our box office opens for in-person, same-day ticket sales 1/2 hour before the first daily showtime. 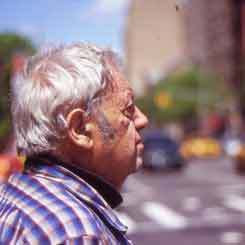 Saul Leiter has made a large and unique contribution to photography. One of our greatest street photographers, working in both black and white and color, he worked virtually unknown for 40 years. His high-profile exhibition at the Museum of Modern Art in 1953 could have set his reputation as a pioneer of color photography, but Saul was never driven by the lure of success. Instead he preferred to drink coffee and photograph in his own way, amassing an archive of beautiful work in his New York apartment. This funny, intimate and moving portrait film follows Saul as he faces the triple burden of clearing an apartment full of memories, being suddenly famous in his eighties, and fending off a pesky filmmaker (Tomas Leach, in his first feature) who only wants to inform the world of his genius. Copyright ©2008 Northwest Film Forum. All Rights Reserved.